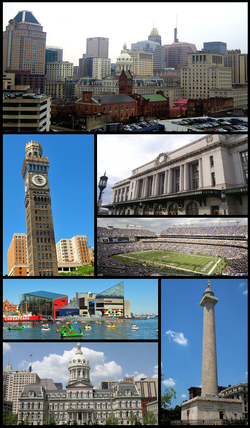 Founded in 1729, Baltimore is the second largest seaport in the Mid-Atlantic. Baltimore’s Inner Harbor was once the second leading port of entry for immigrants to the United States and a major manufacturing center. After a decline in major manufacturing, industrialization and rail transportation, Baltimore shifted to a service-oriented economy, with the Johns Hopkins Hospital (founded 1889), and Johns Hopkins University(founded 1876), now the city’s top two employers. With hundreds of identified districts, Baltimore has been dubbed “a city of neighborhoods”. Famous residents have included the writers Edgar Allan Poe, Edith Hamilton, Frederick Douglass, and H.L. Mencken; jazz musician James “Eubie” Blake; singer Billie Holiday; actor and filmmaker John Waters; and baseball player Babe Ruth. In the War of 1812, Francis Scott Key wrote The Star-Spangled Banner, later the American national anthem, in the city.